Tired of trying to find some footwear that won't clash with your zebra-pattterned pants (like the ones Brian Newcomb likes to wear)? Finally there's the Pirate-approved answer to your problems: These custom-stitched sneakers in Pirate black and grey will accompany any of your fashion mistakes. 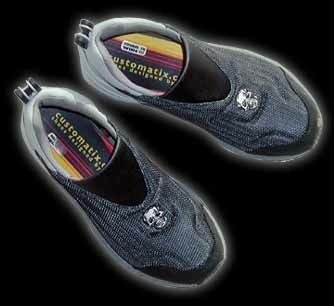 Not only are skulls embroidered on top, but they're also placed into the treads so you can make an impression even if you leave the rink as quick as Glen Chambers does. 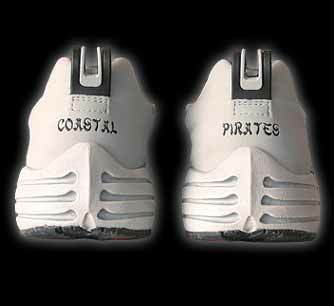 From the back, Coastal is stitched in the left sneaker and Pirates on the right, which will help you keep track of which foot is which in case you get beaned in the head during the game. 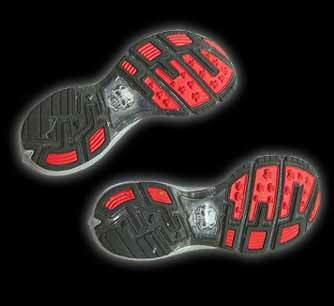 Best of all, they slip right on so you can get to the meeting before the last Pabst Blue Ribbon is gone.